Five books in this mini review batch, all dealing either with monsters of some kind or gods — or both! From xenoprions to werewolves to dinosaurs to various deities, and people who surf the line between godhood and monstrosity, the books I was reading from the end of the summer until just a couple of days ago encompass the whole spectrum. 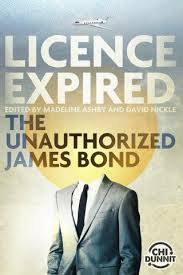 Get the rundown on The Dinosaur Lords, Valkyrie's Song, Tesseracts 18 : Wrestling with Gods, Aurora, and Licence Expired - The Unauthorized James Bond. And, as usual, these reviews come with a warning: Here there be spoilers. Remember when you were a kid and you and your buddies would reach into your toy box and grab... whatever, and just start playing? GI Joe's Cutter (having wrecked the Killer W.H.A.L.E.) and one of the Centurions might have to build a labyrinth of wooden blocks to outwit Darth Vader (all pissed off and looking for trouble because he doesn't have his vinyl cape or light sabre anymore) riding a Crystar lava dragon. Or Boba Fett might get into a slugfest with the Fisher-Price cowboy to see who gets to keep his horse. Or, if there were girls in your group of friends, He-Man and a squadron of Space Lego pilots might have to help Barbie defend her motorhome from a legion of Playmobile knights and their Weeble Wobble shock troops? Yeah you did. And it was fun as all hell. 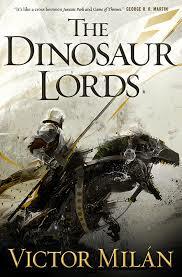 Victor Milan's The Dinosaur Lords is just like that — a wonderful, geeky mashup of armoured Medieval-style knights and dinosaurs. Really, it doesn't get much cooler than that. The story takes place on the world of Paradise (with hints that it could be some kind of distant future colony world or experiment of Earth's) where humans (though not quite Earth-normal humans) who live in a feudal society do what humans living in feudal societies usually do: vie for power, but with the added advantage of being able to harness the gigantic brute might of dinosaurs. Local lords and their knights clash swords and lances atop everything from traditional warhorses, to hadrosaurs, to ceratopsians, and even allosaurs and tyrannosaurs, while peasants struggle to keep out from under foot and survive. In the background, there is the dimly-perceived threat of the legendary Grey Angels, creatures who, in the service of the Creators, have occasionally been known to come to the lands of humans and wreak destruction. The story begins in the empire of Nuevaropa, where a rebellion is put down, only to have the seeds sown for the overthrow of the ruling dynasty. Rob Kerrigan is a dinosaur trainer/keeper, soldier, and bard who finds himself out of work after the battle, and eventually falls-in with Voyvod Karyl, a great general from the losing side who now has taken a job to help a group of utopian aesthetics defend their colony from the depredations of a local lord. Meanwhile, in the royal court, Princess Melodia watches in frustration as her father, the emperor, is manipulated into making bad decisions and allowing the ambitious young Duke Falk (back in the service of the crown after betraying his former partners in the rebellion) to catapult through the ranks at court, even as her lover, Jaume — the only noble who might be able to stop Falk — is sent away to lead another military campaign that gets increasingly out of hand. I'll give Milan a lot of credit for putting this story together. It would be easy with this kind of setting to just give us a one-dimensional sword-swinging romp, or a palace intrigue full of forgettable moustache-twirlers, but even as he serves us all of the fun stuff we'd expect from a knight-and-dinosaur mashup, the author still gives us fully flushed-out characters with who deal with their circumstances in believable ways, such that even as we're enjoying the fun of the larger scenario, the reader takes what's happening to the protagonists very seriously. Which is important, because not everything that happens to these people is fun — some of it is downright horrific — and if they weren't well-rounded, the things they have to endure wouldn't have the emotional impact to make us take the story seriously. I also enjoyed the little details of the world Milan has created: everything from the colloquial nicknames given in passing for dinosaur breeds (such as "fatties" to refer to a type of ceratops filling the niche of cattle), to the very well thought out ways that different kinds of dinos are used in warfare (hadrosaurs as heavy cavalry, triceratops standing in for war elephants, raptors as attack dogs and tracking hounds) and the tactics one would use them for, to the exotic fashions of the nobles who strut about court in brightly-coloured saurian feathers rather than silks (putting me in mind of ancient Middle- and South American empires). It's also a refreshing change for Nuevaropa, the dominant power in the region, to have a Spanish cultural and linguistic influence, rather than the English or French that's typical in fantasy literature. And I'd be remiss if I didn't highlight the wonderful sketches of dinosaurs by Richard Anderson at the start of every chapter. His lines give a terrific sense of explosive movement, while his use of shading in the basic black and white of the drawings creates a sense of dangerous shadow enveloping these monsters, even as it emphasizes their size. I'd almost like to see Anderson publish a companion book of illustrations — not just of individual dinosaurs, but also of whole scenes from the dino battles, and the world in general —once Milan has completed the series. How much did I love The Dinosaur Lords? Let's just say I'd brave the jaws of a T-rex to get my paws on the sequel, The Dinosaur Knights, right now. The life of an ordinary English peasant during the early days of the Norman conquest was not easy. For Tola, having to flee, starving, into the cold wilderness after Norman soldiers killed her family was bad enough. But in doing so, she's discovered that under certain painful circumstances, she can commune with the Norse gods, thanks to the presence of one of Odin's runes within her. It's a talent that's made things worse: Tola's rune has attracted a Byzantine witch who's bent on taking all the runes for herself to resurrect the dead god, a quest that brings her — and her fierce Viking guards — to the north to kill the young woman. If that wasn't enough, a werewolf is stalking the land, and not just any monster: Fenrir, the divine wolf tasked with slaying the gods during Ragnarok. And the wolf has its eye on Tola too. 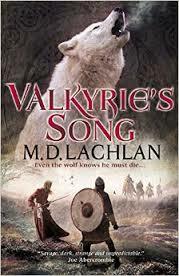 Valkyrie's Song is the latest instalment in MD Lachlan's saga about humans and gods trapped in a cycle of pursuit, torment, death and resurrection in the Viking era. As Odin and Fenir lock horns again and again over the long years, the humans who are their vessels and witnesses try to come to grips with their curse, and possibly break it. Like the other books, Valkyrie's Song picks up decades after the previous installment (Lord of Slaughter), where the woman fated to be the love interest of the man doomed to become Fenrir has again reincarnated. This time she is the farmer's wife, Tola, and her stress at being harassed by the Normans acts as the psychic beacon which attracts the wolf and Odin's minion. While the narrative perspective rotates between several protagonists (Tola, the witch, the witch's Viking shieldmaiden bodyguard, Loys the werewolf, and a Norman lord distracted from harrowing the Saxon north by the rune curse), Tola is the main focus of this story — a change from the other novels where the werewolf tends to be the dominant perspective. This emphasis on Tola is a good decision on the author's part, as it's easier for the reader to identify with her than the other characters. To be clear, Lachlan has done an excellent job of making the other characters three-dimensional and very human — figures that we can identify with when we look at who they are and what their circumstances represent: the witch who wants power, long life, youth and knowledge; Loys the werewolf who struggles to cope with, and maybe overcome a terrible condition that controls his life; the shieldmaiden who's just trying to support the person she loves; and so on. The shieldmaiden in particular is a very sympathetic character. And yet, for all of that, it's easier for us, as modern readers, to identify with Tola, who (for most of the novel, anyway) is just a normal person struggling to survive as she's alternately pushed and pulled by huge, dangerous forces beyond her control, or trying to avoid them. She's more familiar to us than a witch, sword-wielding warrior, or werewolf/godling could ever be. Her ultimate transformation at the end tells us, metaphorically, that it is possible for a normal person to overcome these greater forces, with the warning that this empowerment is a change in self rather than a simple triumph, and one that comes at great cost. Valkyrie's Song is also different from the previous books in that the characters of the witch and werewolf come into the story (or return to the story, as the case may be) not as reincarnates who've had all knowledge of their previous experiences wiped and have to rediscover their circumstances (like Tola) but rather as the same people from the previous era, now immortal (somewhat) and coming forward into the new cycle with full knowledge and more sophisticated agendas. This adds more complexity and tension to the story, even though less time is devoted to their point of view. But for all its strengths in characterization and imagination, the story is weak in the one scene where it — as a dark historic fantasy novel — should be strongest: werewolf versus zombies. Near the end, the witch raises an army of the dead to capture Tola and kill anyone with her. Luckily for Tola, Loys is tracking her too, and his love for her (or, at least his love for her meta-soul through the ages), along with his determination to prevent the witch from uniting Odin's runes, sends him charging to her defence. The set-up for a collision between a god-wolf and an army of undead would have any fanboy slavering in anticipation, but Lachlan denies us the satisfaction, giving the fight a brief mention before shifting back to Tola's flight. Sure, the past three books have entertained us with plenty of scenes of carnage as Fenrir (in various stages of transformation from human host to giant wolf thing) tears through opponents, and yes, this story is more about Tola's journey and transformation (the title of the book is, after all, Valkyrie's Song) because the wolf has already had his day, and, admittedly, it's a battle that really has no influence on the outcome of the story, but come on! WEREWOLF VERSUS ZOMBIES! This monster mash-up is just too huge to gloss over! A few more paragraphs, or even a short chapter (and the chapters in this novel are short enough already to allow it) to give us a full blow-by-blow would have done the trick, but no such luck. This was the only time in the entire series that I've been disappointed with Lachlan's plot choices. Overall though, the book is well put together, with pacing that tears along like a marauding Viking band sacking a fishing village on its way to a monastery. It's a grim study in how people deal with fate and the choices that make us human — or not. I wanted to love Tesseracts 18. For years, this anthology series has been the premier (at times, only) collection of Canadian short speculative fiction. Time was, I couldn't wait to get my hands on the next instalment. But over the past few years, it's become hit and miss. There have been Tesseracts books that not only didn't contain a solid line-up of great stories, but were downright forgettable. Now, each year, I hope for a return to the glory days when I can finish the collection, put it down, and say "Wow!" in a good way. Sadly, it didn't happen this time. 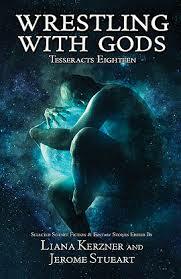 Wrestling with Gods wasn't a terrible collection. There were a few good stories in it, like "The Harsh Light of Morning" by David Jon Fuller (you wouldn't think it possible to make the Residential School Program more horrific, but this story succeeds), or "Summon the Sun" by Carla Richards (which felt like a good Connie Willis story), or "So Loved" by Matthew Hughes (which didn't go in the direction I thought it would), or JM Frey's "The Moral of the Story", or "Chromatophoric Histories of the Sepiidae" by James Bambury, or Savithri Machiraju's "Ganapati Bappa Moriya!" — in fact, the entire back half of the book was good. Not especially memorable, but enjoyable and interesting. But the first half was weak. Too weak. Every other story in the first half of the book seemed to leave me wondering why it had been included. And while it's good to finish an anthology on a high note, if you don't have a strong opening followed by consistently good choices, it's hard for a reader coming it at for the first time to justify slogging through in hopes of maybe finding something worth while later on. You may disagree. Everyone's got different tastes in literature, and maybe Tesseracts 18 — Wrestling with Gods will be like a gift from the heavens for your book shelf. For me, it was more like a decades-long trek through the desert to get to, well, not exactly the promised land. At first glance, master of hard science fiction Kim Stanley Robinson takes a hard look at the ideas of generation ships and interstellar colonization in his newest work, Aurora. Narrated by the titular ship's AI (a narrative choice that's reminiscent of Robert J Sawyer's Golden Fleece), the story begins with the colonists aboard a generation starship headed towards a (relatively) nearby solar system, trying to maintain both their environmental/biological balance in a closed system and their vessel's mechanical systems as they close in on their destination. And those efforts are proving to be increasingly problematic as the years go on: the birth rate is declining, the new children don't seem to be up to the health standards of the previous generations, bacteria are starting to outpace the colonists' ability to deal with them, and mechanical systems are starting to wear out. Among the younger colonists is the chief engineer's daughter, Freya, who initially is feared to have no practical aptitudes, but soon demonstrates a knack for being able to get people to communicate, both with her and each other. Freya falls into the role of unofficial shaman, wandering the ship's different habitats, learning a little general knowledge about its different operations, and developing a deep understanding of its people. As the story progresses, the colonists have to deal with the harsh realities of trying to set up a colony in another solar system with no likelihood of help from Earth, the dangers of their failing shipboard systems, health hazards (from their own relentlessly mutating bacteria and an alien prion), civil war, the risks of a voyage home, and the reception from a civilization that hasn't thought about them in years. It's a tale that paints a pretty bleak picture about the notion of setting out to spread humanity among the stars, reinforcing the need to protect an Earth that our species probably needs more than we fully appreciate. But that's not what the story is really about. We're told that the narrator is the ship's AI (or group of AIs), chronicling the story of the Aurora at the request of the chief engineer. Initially, its style is simple, mechanical, and objectively factual as it zeroes-in on details (some of them painfully, unnecessarily specific). Gradually though, it softens its approach as it adopts Freya as its primary focus, becoming more interested in her experiences and who she is, and more intuitive in its portrayal of her. We see the AI begin to develop emotions (such as annoyance at the colonists during the civil war, along with a shade of smug imperiousness) and introspection (during its long, stretch on the trip home when everyone's hibernating, there's a moment where it seems less like HAL 9000 and just a touch more like Red Dwarf's Holly going mildly batty out of loneliness). And then, near the end, we're shown explicitly that our narrator is entirely unreliable. When the narrator (which you'd think, being an AI, is the most reliable narrative source you could have) describes Freya watching the destruction of the Aurora and then continues the story of Freya's experiences on Earth, the reader —knowing that the narrator/AI is inextricably a part of the ship — is forced to doubt every single fact of the story. A no point is there made any mention of an afterlife (biological, AI, or otherwise), nor is the AI copied to another host. And yet it continues to tell the story of things that happen after its destruction. And if we conclude that the narrator/AI is making up everything that takes place after its supposed death for artistic purposes, we can't take anything in the previous parts of its story for granted either. Taking this thought to its ultimate conclusion, we're forced to ask whether we can even believe that the narrator is even the ship's AI at all. So if all of the details in the story are thrown into question, what's it really about? Aurora is about how we are made human by the act of telling a story. By continuously changing and improving the way it tells the story as the story progresses, as a means of better engaging the human audience it's trying to connect with, the AI itself evolves and becomes more human. It develops from something a little more sophisticated than MU-TH-UR 6000 from Alien, to something more self-aware and feeling — probably equivalent to HAL 9000 from 2001: A Space Odyssey — to ultimately something much more: maybe not the slightly daft Holly of Red Dwarf, or the Doctor from Star Trek: Voyager, or the crotchety Nell from Battle Beyond the Stars, but at least something — someone — more akin to the more sensitive HAL 9000 from the end of 2010: The Year We Make Contact. Aurora tells us that even as we make the story, it makes us. The making of the story — the struggle to put thought into words, to communicate in a meaningful way to another mind, to impose meaning on the universe (even if that meaning is communicated through fiction) — makes us human. 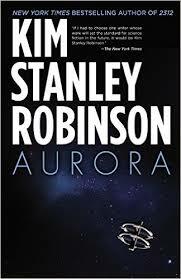 As with The Years of Rice and Salt, Kim Stanley Robinson has shown us in Aurora that beneath the hard details of a straightforward, factually grounded story, there are deep layers of meaning about the human experience. If the theme for this set of mini reviews is monsters and gods, and this blog as a whole is dedicated to speculative fiction, what's a collection of short stories about James Bond doing here? Bond's world of gadgets and of super villains concocting elaborate and often impractical word-dominating-or-destroying schemes from extravagant lairs ranging from mansions to volcanoes while employing armies of flunkies and monstrous henchmen using strange signature weapons or execution methods are all familiar to SF fans. Bond himself is unhuman in his ability to withstand torture and injury — repeatedly — that would kill most people outright (including the punishment of his own body through high levels of alcohol and tobacco consumption), to tirelessly do feats of physical prowess, to assimilate endless languages and abilities, to keep Lady Luck at his side in any casino, and to get pretty much any woman he wants any time he wants without any real consequence. While Fleming's original books may be somewhat more grounded than the movies they inspire, it never feels like much of a leap to get to the realm of sf, and sometimes there's no leap at all. As to monsters and gods, Bond is both: clearly a god among assassins and spies, but monstrous in ability to kill and inflict pain without remorse, to think only of his own satisfaction in indulging in the pleasures of the earth — and specifically in his treatment of women, which don't seem to rate much higher in his mind than the food, alcohol and cigarettes he consumes. To that end, it couldn't be more appropriate to talk about Bond on this post. And so we get to Licence Expired, a collection of new short stories about 007 and his world, inspired by Fleming's original works and made possible only because of copyright laws in Canada (a notion that itself seems ripe for some sort of Bond story about rogue publishers — maybe with eye patches, or diamond-encrusted elbows, or henchmen riding turbo-powered pogo sticks — flouting the law by hiding out in some differently-legislated country as a means to bring the world to its knees). It's a collection that is one of the most entertaining books I've read in the past year. It's hard to pick out favourites from The Unauthorized James Bond because the stories were all so good! Really, it was a pain worse than Jaws' stainless steel orthodontics having to put this book down sometimes, instead of continuing on to the next story, and many of them are worthy of a 00 designation. Some were more rooted in conventional reality, like the opening shot by Jacqueline Baker, "One Is Sorrow", about a woman who meets a very young James; or Bond's rescue of a kidnap victim in EL Chen's "Half the Sky"; or Claude Lalumiere's "You Never Love Once", about a mob enforcer's encounter with an aging 007; or "Not an Honourable Disease" by Corey Redekop, also about a run-in with the spy in his later years. Others whole-heartedly adorn themselves with science fictional trappings, like the virtual reality prison in Kelly Robson's "The Gladiator Lie" (with that gleefully gory, unforgettable line: "The assassin's skull opens like a book..."); or Ian Rogers' post-apocalyptic "Two Graves". And then there's everything in between, like Charles Stross' wonderful neocon super villain harangue "No, Mr. Bond!" Whether you're a Bond fan or not, if you live in Canada, buy this book. If you don't live in Canada, find yourself a secret agent or an amenable super villain and get this thing sent to you via robotic groundhog or other overwrought covert means. After all, you only live twice: once to read this review, and once to read the actual collection.